I was featured on the Evernote blog yesterday, and I couldn´t be happier! Due to different time zones, yesterday morning (Spanish time) I announced the new feature, my way. In the afternoon, I read the Evernote blog and there I was! I am very honored that they have had me on the blog to present this new feature that will make your lives much easier since you create your account: “Templates”. Evernote, a new way of working, more productive, more efficient and now, much more comfortable thanks to this new feature. That a company with 225 million users around the world counts on me to present the star feature of the latest version, makes me feel … how would I say? … Like a million dollars!! Next, you can read the official presentation of the new feature. Enjoy the templates! I am so excited by this news that my hands tremble!!! Where do I begin? At the beginning, you are right. As you know, the fitness industry is hard and publicizing an internet business is possibly even harder. For these reasons, I am always looking for ways to promote my business. Last weekend, I found the list of the best 100 blogs and websites to follow, provided by Feedspot. What´s Feedspot? It´s a RSS Reader. If you’re trying to keep up with news and content on multiple webs, Feedspot allows you to put all of your reading in one place. 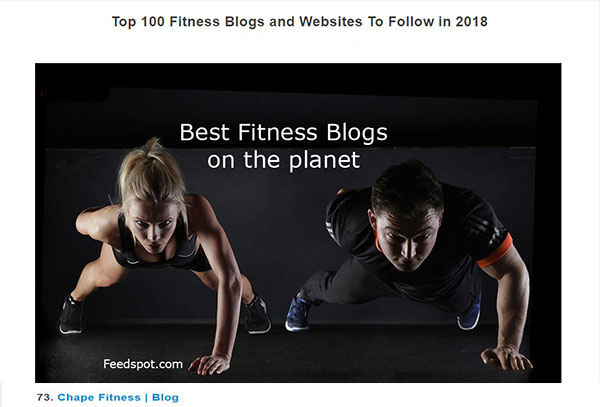 There is an impressive amount of fitness blogs out there and this list includes the best on the planet like Men´s Fitness, Reebok Fitness Blog, MyFitnessPal Blog, ACE (American Council on Exercise), or Anytime Fitness Blog, just to name a few blogs among the top 10. Call me foolish, but I decided to submit my blog, with little or no hope of accessing the list. I would be happy to enter the Feedspot fitness blog directory and get some more readers. That´s what I expected. What I got, so you can guess by the title of this post, was to enter the list. I am not in the position #100, or #99, not even #90 or #80. Dear friends, my blog is on the list at number 73, which is not bad if you realize that I do not have a team working on this blog. Just me! I am so happy and proud right now… that I´m going to take the rest of the day off!! I think you will agree with me… From time to time a break is necessary to savor the achievements and victories. This news is both an achievement and a sweet victory after a long time blogging. Don´t worry, I will return with new content and much more energy before you realize that I have taken a day off, I promise. I’m looking forward to climbing some positions. I know I will never make #1 but, top 50? I´m going to try it. From a small Spanish coastal town to the top 100 fitness blogs on the planet, today is a day to remember and celebrate! Thank you all, lot of love and, as always, big hugs!! “Thank you so much for participating in the Evernote Community Leader training. I really appreciate you working through the exercises and for your patience as we’ve been reviewing everyone’s exercises! Chape´s method is about to change the fitness industry! Do you imagine sharing a digital notebook with your trainer/client where you both what´s done, what´s not, workouts, meals, articles and research papers, reports from other apps, always at hand? Yes, heaven on earth. Speaking of quotes, do you want to know which is my very favorite? I know I should say have a great day but, I´m so joyful right now, I have to wish you a great decade ahead, it´s how I really feel it.